Stage shows and musicals are one of the best parts of the holidays. Programs like the “Radio City Christmas Spectacular” and the Macy’s Thanksgiving Day Parade are part of the razzle-dazzle of the season of giving. “Elf,” the musical based on the 2003 hit film now showing at the Walnut Street Theatre, is just as sparkly and jingly as any other seasonal extravaganza. The original film was an instant classic, and Will Ferrell’s one-liners in the starring role continue to make everyone giggle even 10 years later. With a cultural imprint like this one to live up to, playing Buddy the Elf onstage can only be done by someone with comedic timing and slapstick, someone like Christopher Sutton. Sutton has appeared in many New York City shows, tours and roles at the Walnut Street Theatre. He has also been nominated for three Barrymore Awards, receiving one. Accomplishments aside, Sutton does a wonderful job of bringing Buddy’s lighthearted spirit to the stage. If you are familiar with the movie, the first few scenes of “Elf” onstage may look like Sutton is just doing a Will Ferrell impression with one-liners intact. Fortunately, it’s still a pretty good impression. As the musical goes on, Sutton finds his groove with the help of less film-script-dependent scenes. It seems he has taken Ferrell’s mannerisms from the film and tweaked them so that they are still familiarly hilarious to the audience but funnier because they seem fresh and real. By the end of the show, the audience is paying close attention to Buddy, knowing to look for his earnest, deadpan jokes. Another standout is Kate Fahrner as Jovie, Buddy’s love interest. She plays a shy woman who moved to the Big Apple with even bigger dreams and was disappointed. Fahrner plays the anti-social, awkward young woman so genuinely that you may think she’s never been onstage before a day in her life. Her voice is top notch, easily the best in the cast. The chemistry between Fahrner and Sutton is far better than that between Ferrell and Zooey Deschanel. ; For fans of the film, this is definitely something to look forward to. The narrative is framed by Santa Claus, played by Bill Van Horn. Santa’s lines are often tweaked to make them Philadelphia-specific, letting Van Horn break the fourth wall a bit with a wink and a nod. Buddy’s biological father is played by Charles Pistone, and his stepmother and brother are played by Kristine Fraelich and J.D. Triolo, respectively (though Tyler Hentz performs the role of Buddy’s brother during matinee performances). The family scenes are a bit forgettable, leaving the audience waiting through ballads to get back to Buddy or enjoying the vocals of the family but wondering if their songs are necessary. Visually, the set pieces and costumes of “Elf” are pretty gaudy and bright, just as they should be for a comedy about a Christmas elf. The set itself is full of glitz and glam, even when the show shifts from the splendid North Pole to the grit of New York City. From afar it looks like a holiday diorama wrapped in a sparkling bow. With the exception of some not-so-great special effects, the show looks to have a higher production value than other recent regional musicals. The elf costumes were equally delightful, especially on the teeny-tiny children’s ensemble, which by itself was just adorable. Sutton as Buddy is not supposed to be a particularly blessed singer, and Jovie doesn’t receive nearly enough stage time, so the bulk of the music is left to the company. Luckily, the real magic of the show occurs in these company numbers. Full of amazing tap dancing and some pretty expertly synchronized choreography, each dance number is extremely fun to watch, with the vocals to match. When the company’s toes start moving, chances are you’ll want to move yours too! The comedy of the show may skew younger and older than the typical Drexel student, but “Elf” is definitely worth seeing if you need a holiday pick-me-up or have lost your Christmas spirit. If you have a younger sibling or cousin or an older family member who loves a good show, “Elf” is the perfect spot for some family fun, as cheesy as it sounds. 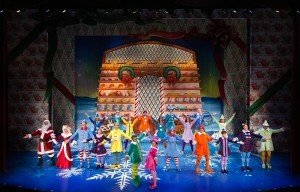 “Elf” will be playing at the Walnut Street Theatre through Jan. 5. Visit WalnutStreetTheatre.org for tickets and showtimes.